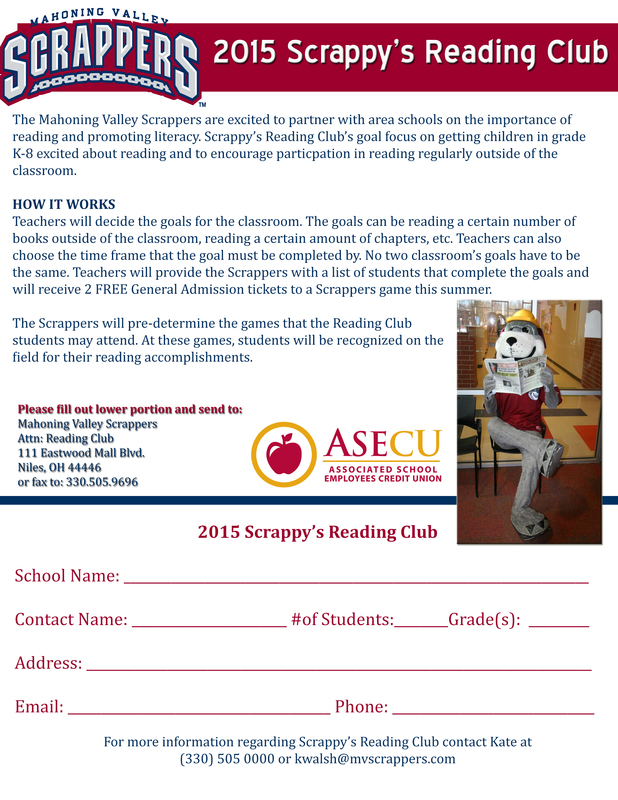 The Mahoning Valley Scrappers are pleased to announce the return of the Reading Club presented by Associated School Employees Credit Union (ASECU) and ComDoc. The Reading Club is implemented within schools and libraries from Mahoning, Trumbull, Columbiana, Stark, Portage, Mercer (PA) and Lawrence (PA) counties. The goal of this program is to promote the importance of literacy and education while at the same time fostering a life-long love of reading. It's a completely free program that provides teachers with rewards for students who reach their reading goal. Students that complete the goal set by their teacher receives two FREE tickets to one the designated Reading Club game dates. Parents, if your child is not participating in the reading club in his/her school; you can sign them up as individuals. You can sign them up by returning an enrollment form and then tracking your child's reading with the Reading Club bookmark. Once they have reached their goal, your bookmark is now a voucher that is valid for two FREE tickets to one of the designated Reading Club game dates.